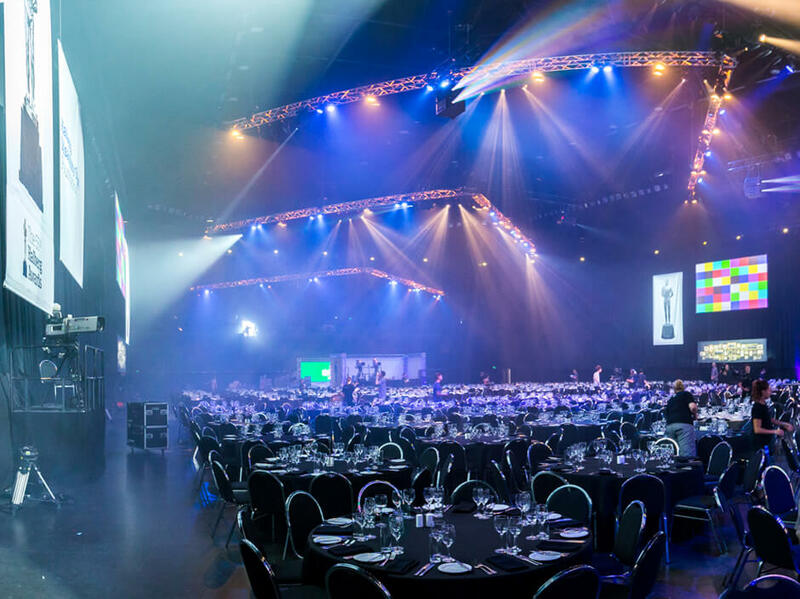 To provide full production equipment & personnel for the live broadcast event, a Black Tie Gala Dinner for 1200 people at Spark Arena, Auckland. 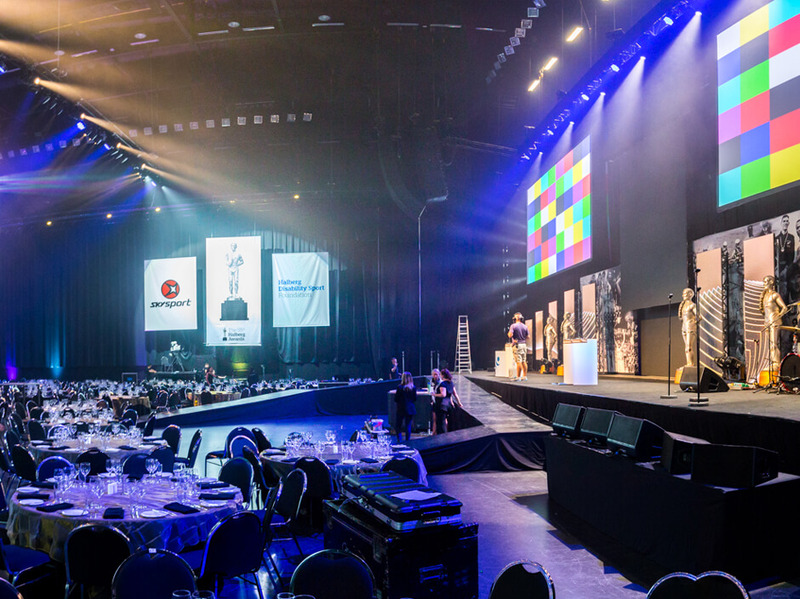 Oceania Productions provided Lighting, Audio and Vision systems for the awards. 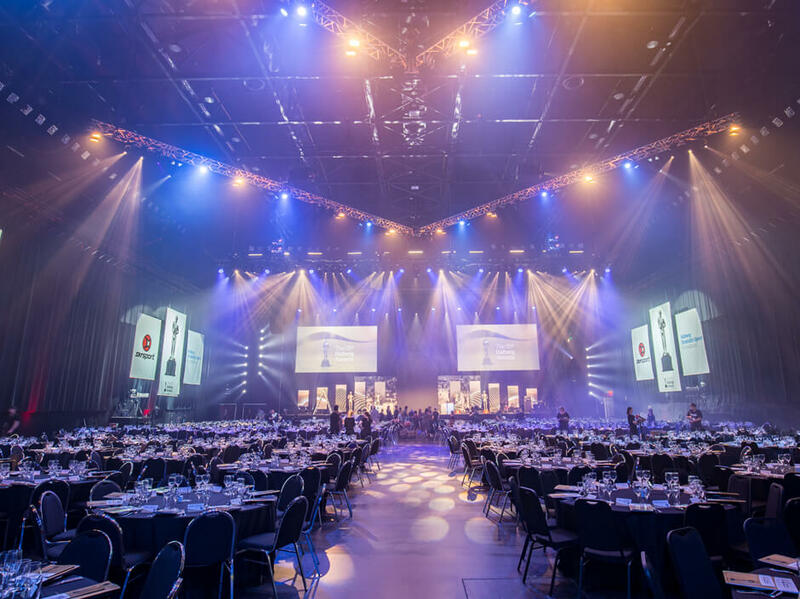 Lighting designer Simon Garrett’s goal is always to make the live event ‘look’ as close as possible to the broadcasted event. He also thinks it’s very important to make the guests look and therefore feel good from the red carpet to the stage. He assumes they will review the show and look critically at the people. Garrett considers tungsten a natural choice for both tables, stage and lecterns which means a 3000k white balance. Oceania have used ETC’s revolutions for this task for some years and they work very well. Typically to balance stage with audience, Garrett would use a combination of tungsten softs and profiles with gobo’s adding a layer of moving light textures for depth and visual interest. This time Oceania cut the softs by half and added a layer of RGBAW fixed LED wash as a base to adjust on the fly. New GLP X4L wash units were added to cover the audience near the stage with a gobo and beam wash from sixty-five 280R Pointe generics over the rear half of the audience. These provided texture and hype looks and the layering and shifts of colour worked well in the long shots while saving 6 hours from the normal focus time. Programmer Jason Steele did some great work with the cameras on the live show look while Garrett works the floor, foyers and overall package. Vision at the event was a combination of projection and 3.9mm LED screens. Oceania ran projectors at 5500k as a compromise between looking warm live and blue in the broadcast. The team did a lot of work on the LED to get the green under control with the gold Halberg graphic content. 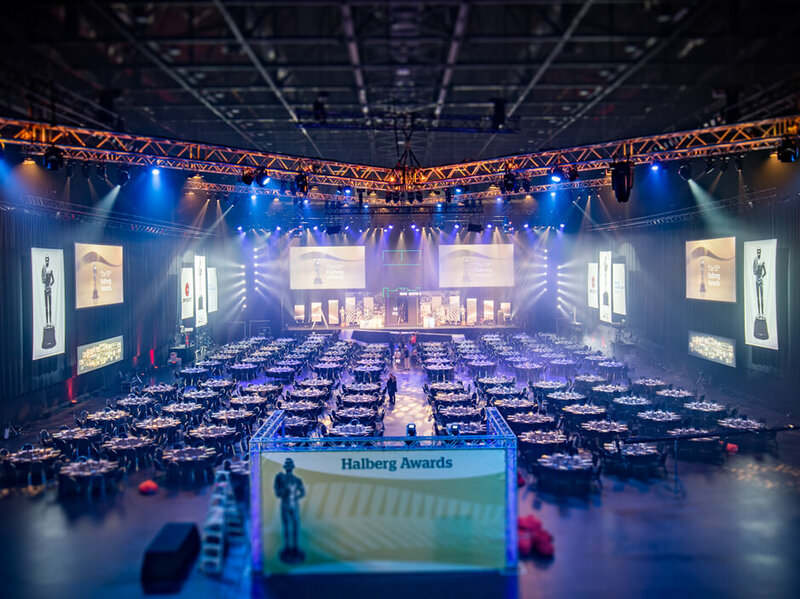 Audio Designer, Nick Maddren was given a brief to deliver clean audio for both the live audience and television. This year Oceania used Array Processing on the D&B J series system. Maddren understands that if we were to have issues of getting a good amount of volume in the room it would become very easy to make the TV sound very roomy or worse have a constant ring in the TV audio. By Array Processing the D&B system Oceania are able to deliver more even coverage allowing much better gain before feedback. Sky TV has worked closely with Oceania on various events over the years.